The temperature at which a pure substance (such as water) freezes can be lowered by adding salt. 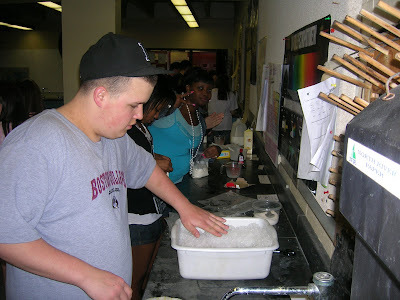 The change in freezing point depends on the concentration of the salt solution. 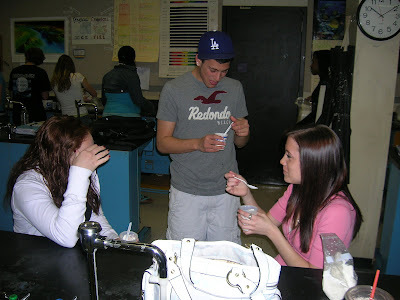 Students used this phenomenon to make ice cream. 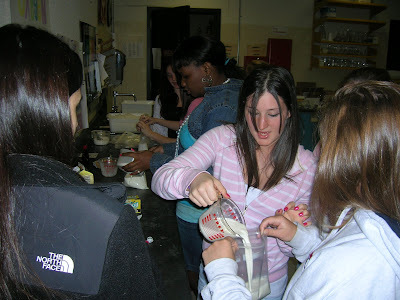 First students mixed the ingredients (milk and sugar) in a small freezer bag. This bag is then placed in a larger bag containing ice and salt. Since the milk/sugar mixture has a freezing point lower than ice water, students had to lower the freezing point of the ice by adding salt. Lowering the temperature of the ice caused freezing point of the ice solution to decrease allowing the milk / sugar mixture to freeze.